This is what Jeremy said to me after our 64 hours on a Chinese boat followed by 5 hours on a local bus. 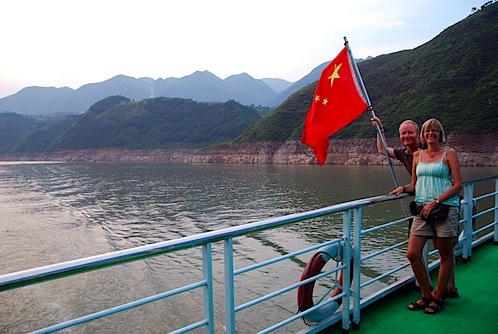 This is not to say our cruise down the Yangzi River (which, strangely, is actually called Chang Jiang in Mandarin…you’d think it would sound more like “Yangzi”) through the Three Gorges wasn’t fun. In fact, in some ways it was the most memorable and amusing experience we’ve had thus far on the China leg of our trip, precisely because it was a crash course in Chinese sociology. It was a hilarious, frustrating, stinky, entertaining, and flat-out “this can only happen in China” kind of experience, and it’s one that we won’t soon forget (whether we like it or not!). 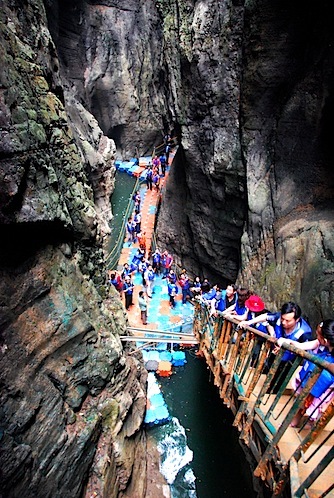 The first gorge: Qutang Gorge. But let me start from the beginning. 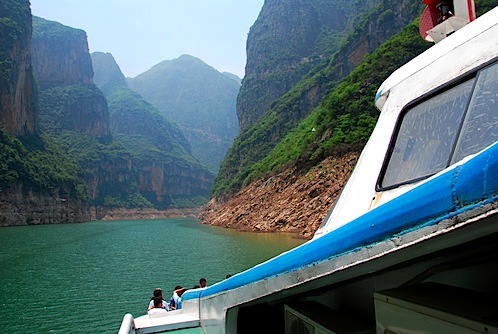 While we were in Chongqing, my aunt’s friend Huang He helped us arrange our cruise down the Yangzi…and by “helped,” I mean “did all the work.” So we had even less of a clue than we usually do when it came to logistics: what would our boat look like? Where would we be going? Will there be enough food? All we knew was that we were getting on the boat in Chongqing on a Thursday night, and we’d end up in Yichang on Sunday morning, followed by a bus ride to Wuhan. Little did we know we were in for almost 70 hours of a full immersion Chinese experience. Boat trips down the Yangzi are not cheap, and given the price we were paying (a little more that 1000 RMB each, or approx. US$150), I knew that we were going to be on a budget boat. The boat itself was not too bad…a little run down, a little grimy in the bathroom, and a lot gross when it came to the carpet, but the sheets were clean, the AC was pumping, and there was a nice sun deck on the top floor of the boat, so we weren’t impressed, but we weren’t disappointed either. The one thing that would prove to be a problem was that the boat was clearly built for people are about 5′2″…both of us had problems fitting on the bed and Jeremy grew a full inch in the days we spent floating down the Yangzi because he hit his head so often on the doors, the shower head, even the ceiling (repeat: THE CEILING)! For the three days we were on the Chinese boat, we were 12FOOT4. But for the dozens of other middle class Chinese tourists we were traveling with, the boat trip had very little to do with the boat, or even the Yangzi River. It seemed that the Three Gorges were just something to pass the time in between bouts of chain smoking, playing mahjong, and walking around in their underwear…you know, stuff Chinese people usually do on vacation. But seriously, China has a way of making you realize just how socialized you are to the Western form of behavior. It challenges your ideas of what right and wrong are on a daily basis. And the country can demand respect—or at the very least, acceptance—of certain Chinese conventions and habits. In other words, China forces you to accept the fact that just because it’s different doesn’t mean it’s bad. Yeah China! The sun sets on our second night. On the boat, you can’t hide from these quirks of Chinese culture, as we found out our first morning, when we were woken up bright and early by our tour guide…this is a Chinese tour after all, gotta have time to squeeze those 472 events into the day! As we came to find out, we had purchased entry tickets to all the sights along the cruise route (and additional 300 RMB or so, approx. US$44 each), but they weren’t mandatory…many people opted to sleep in rather than get up at 6 AM to see this temple or that ghost town. Of course, those who didn’t buy tickets to the morning excursions soon found that they couldn’t sleep in anyway, since breakfast in the boat’s dining room is announced with an ear-blasting, “GE WEI LU KE, WO MEN CAN TING ZHENG ZAI YU BEI ZAO CAN, WO MEN CAN TING ZHENG ZAI YU BEI ZAO CAN!! !,” repeated over and over and over again on the loudspeaker (Translation: “GREETINGS GUESTS, OUR DINING ROOM IS NOW PREPARING BREAKFAST, OUR DINING ROOM IS NOW PREPARING BREAKFAST!!!). Chinese tourists on a mahjong break. One of the many off-boat excursions we had…this one was a hike through a narrow gorge area. Noise is pretty much a part of any Chinese activity, so that was to be expected. What can I say? Chinese people like a ruckus. Many of them would go nuts in a place like New Zealand, or in the American suburbs. What we didn’t expect was so much underwear. Now let me get one thing clear: we got on the boat at 9PM on a Thursday night. By 8AM the next morning, there was already laundry hanging on the top floor sun deck. 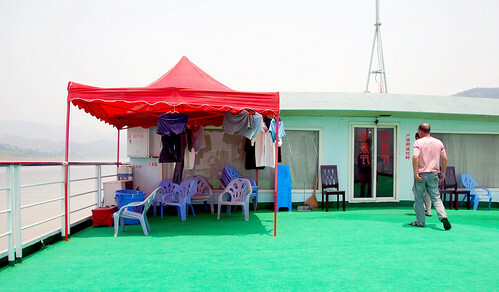 Yup, there it was: a whole family’s underwear, flapping in the Yangzi breeze, on the shared upper deck of the boat. How is it possible that we have been on the boat for less than 12 hours and an entire family of four has already had to wash their underwear? When did they wear this underwear? Did they only bring one pair each? Or did they wait to do their laundry during their vacation? So many questions…and so much underwear! And it kept multiplying as the trip went on—there was underwear hanging in windows, on the railings, and of course…around the hips of many Chinese men with giant Buddha bellies. You gottta hand it to them—the Chinese sure know how to make themselves at home! Underwear and other assorted laundry hanging on the upper deck of the boat. 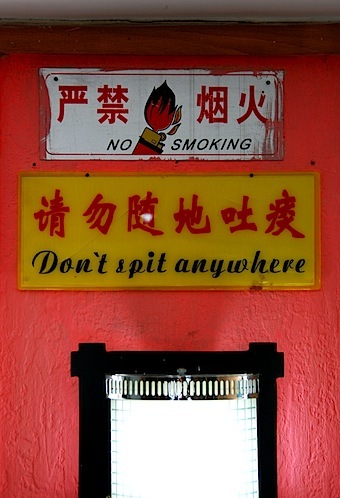 Another aspect Chinese life transferred over to the boat as well: spitting. The spitting itself is not so much the issue, but the deep, sonorous snort that precedes it, followed by the hacking up of the fluids in question, culminating in the final (often messy) expulsion of the offending matter. 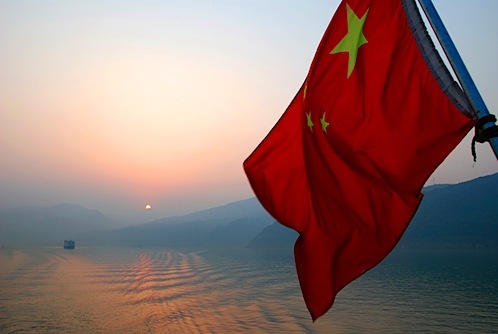 And they spit everywhere, even places that seem like they should be off limits—in nice restaurants, on the carpet, and yes, on the Yangzi River boat. Thankfully, we weren’t the only ones amused by the Chinese boat. There were a couple other Westerners on the tour as well…a nice couple from Denmark who were also on a year-long excursion (Michael and Janne), a cute German couple, and an 86-year old American who was backpacking his way through China (Richard)! The Chinese tour guides really wanted us to stay together so that I could translate for them…I think they were a little freaked out by all the Westerners on the Chinese boat, since a lot Westerners opt for the more luxurious cruise lines. We had a wonderful time hearing about Michael and Janne’s year-long trip (their second! The took a year off when their kids were young to camper van around he US and Mexico), and Richard’s wild adventures (the man has been to 123 countries in his lifetime!). Michael and Janne, around-the-world travelers from Denmark. 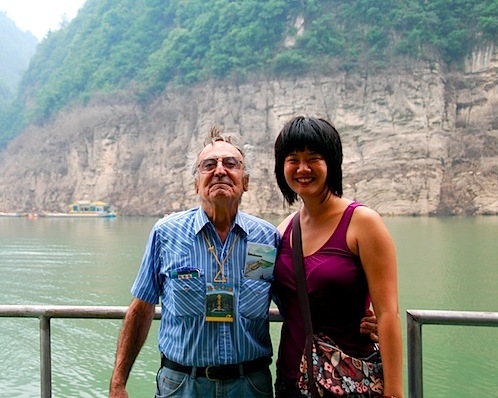 Me with Richard, the spunky 86-year old backpacker! So many of you are probably wondering: OK, enough about the Chinese (and non-Chinese) people, what about the actual boat trip? Honestly, the Three Gorges became almost secondary for us too, as we soaked up this Chinese immersion experience. But some aspects of the trip are definitely worth mentioning, so here goes. 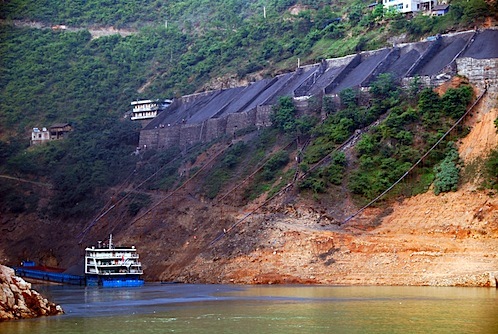 As you’ve probably heard, the Three Gorges Dam project was extremely controversial…it basically displaced 1 million Chinese people (which, quite frankly, is a drop in the bucket for a country of 1.3 billion), not to mention the environmental impact. We were really interested to see if the gorges could still be considered stunning, even if they were essentially 500 feet shorter than they used to be. The short answer? Yes and no. The long answer? 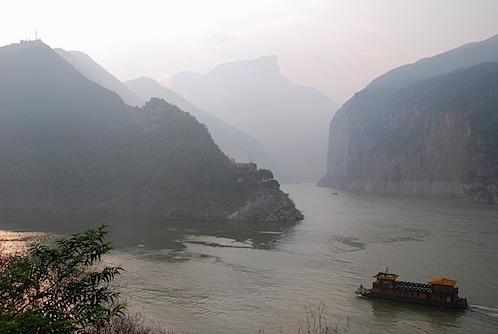 Yes, they are still stunning, particularly the Little Three Gorges (despite the copious amounts of litter we observed). 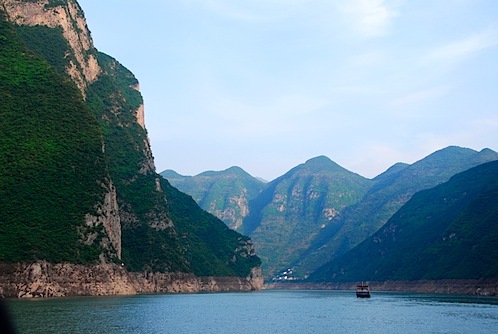 But our favorite was Xiling Gorge, the last and longest gorge, even though Lonely Planet describes this as the least impressive of the gorges. 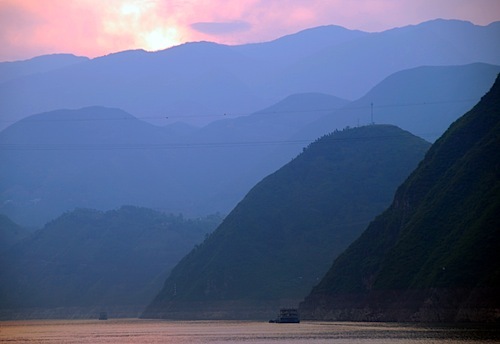 I suspect our experience with Xiling had more to do with the fact that the atmosphere was quite clear and the sun was setting as we went through this gorge (cloaking the surrounding mountains in a beautiful, misty light), rather than with the actual topography of this area. Traveling through the Little Three Gorges. Despite the beauty of Xiling and the Little Three Gorges, there were some not-so-beautiful aspects of the trip that you couldn’t ignore (besides the underwear). I thought that as we drifter further away from Chongqing and deeper into the countryside that the air quality would improve. Not so. A heavy smog followed us the entire trip, and only lifted for a few brief moments as we passed through Xiling Gorge. And even though the water in the Little Three Gorges was much cleaner than it was elsewhere along the Yangzi, you couldn’t ignore the trash floating on the surface, or the dead fish (I am not sure if this was due to pollution, or if a fishing boat had recently passed through the area). There were huge coal repositories on either side of the river, waiting to load up passing barges, and also depositing huge amounts of coal into the river. And lastly, new, generic towns had sprung up all along the Yangzi riverbanks, I guess to replace the villages that were underwater. But it seemed to us that these towns, filled exclusively with bathroom-tiled high rises, were completely empty. Perhaps they were rejected by the Yangzi’s previous residents? Or maybe these towns are an “if you build it they will come” type of experiment by the Chinese government? In any case, we found it odd to see so much construction, and yet so few residents. Trash floating in the (comparatively) clear waters of the Little Three Gorges. Barge getting filled with coal. Anonymous town along the Yangzi River. The Three Gorges river cruise was definitely worth the time and expense for us. We met some wonderful new friends and got a crash-course in Chinese culture. But we did hit our limit…Jeremy on the final morning of our boat trip, when the thick layer of cigarette smoke at 6 AM just got to be too much, and me on the 5 hour bus ride to Wuhan, when the locals kept closing all the windows despite the 90 degree heat…and then coughing without covering their mouths (Hello! Ever hear of a little thing called swine flu?!?). But let’s not forget that the highs and the lows are what make any travel experience memorable, and we got more than our fair share of dips and peaks (and spitting and underwear) on this excursion. An extremely rare blue-sky moment as we pass through Xiling Gorge. The water level has been quite low recently…you can see how high the water line normally is on the mountains surrounding the river. Our first off-boat excursion was to a “ghost town,” named Fengdu or Gui Cheng. It had an extremely strange set of statutes, like the one pictured above. 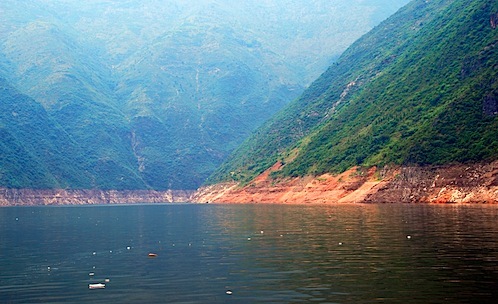 The entrance to the Little Three Gorges. 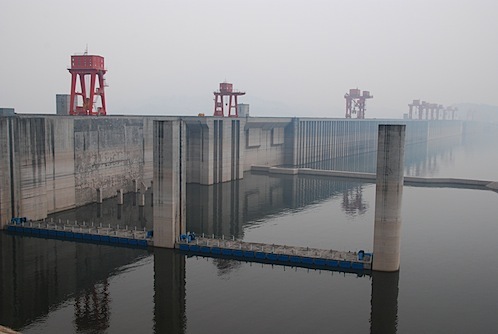 The actual Three Gorges Dam. Somewhat disappointing in person, because you cannot get close to the dam for security reasons. Plus, the smog and fog were extremely thick that day…we couldn’t even see the other end of the dam! Can’t…..stop….laughing. I’m glad you made made the trek because the story is priceless. Very interesting post! I think for what you paid, it’s quite worth the money. The western ships only have 3 shore excursions. It seems that you had more than them. The “strange” statutes in the picture are just one the of “ghosts” in Fengdu ghost city. I went there a few years ago, i remembered hiking up the mountain, it was very hard, i wish i took the cable car. China certainly has plenty of pollution problems, and Chongqing is one of the most polluted cities in the world. However, Westerners often mistake natural fog for pollution…especially in China. The pollution didn’t follow you on your cruise down the Changjiang river, this area has been foggy forever. Even Chongqing, which is heavily polluted, has always been foggy, like London. 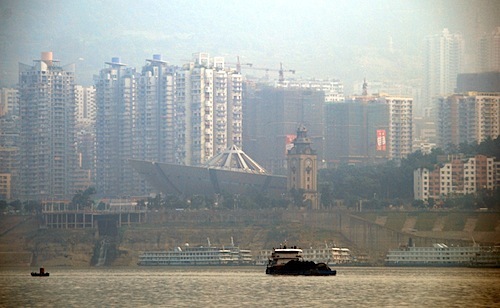 Being at the confluence of two major rivers, Chongqing has lots of humidity, and the surrounding mountains trap the fog. Long before industrialization, Chongqing was know as the “foggy city.” Also, the Wu Gorge really means “witch gorge,” but people often change the tone on wu to the 4th tone, changqing the meaning to “foggy gorge.” This is nothing new. This part of China has always been foggy. Sure, industrialization has mixed plenty of nasty particles in with all that fog, but Westerners often mistakenly think that they can judge air quality by visibility. I have asthma, and I was certain air quality was going to be a problem in China, but I found the air quality in China to be about the same as in Los Angeles. After I returned, I did some research and the scientific data verified what my lungs were telling me…Beijing now generally has about the same air quality as Los Angeles. I know that is hard for many Westerners to understand, but there are people from US universities helping with the monitoring, and over the past couple of years, air quality has dramatically improved. It is important to remember, Americans are by far the biggest polluters on the planet. Sure, China passed the US in total pollution production, but they have four times as many people. So on a per capita basis, Americans produce four times more pollution than the Chinese. Of course the Western media really plays up the pollution in China, so Americans naturally assume that because visibility is poor, there must be a lot of pollution. Hope is 5 foot 11. Jeremy is 6 foot 4. Together we are 12FOOT3. This is our around-the-world travel blog. Come see the world from our point of view.